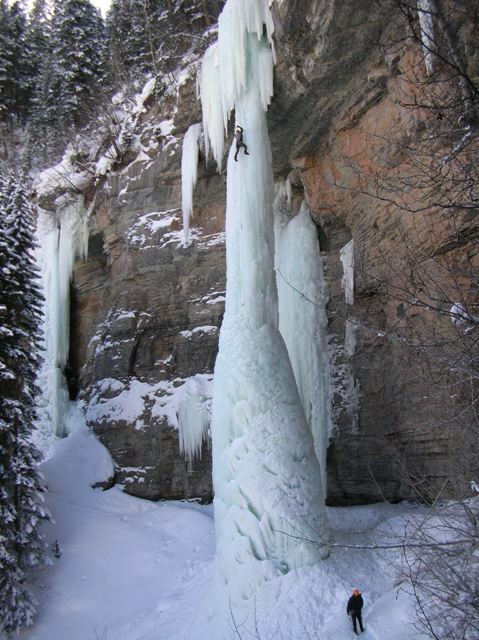 Colorado ice climber falls 100 feet Tuesday (1/12/10) when the Fang ice formation in East Vail Colorado unexpectedly sheared and fell , with the lead climber on the route. Below is an email I received from Griz with his report and prospective. We wish the climber a speedy recovery. 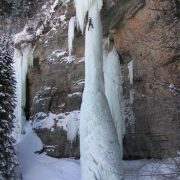 Yesterday at 1pm the Fang in Vail unexpectedly sheared and fell , with a lead climber on the route. I have heard rumor that his tools were above the roof line fracture, yet the falling pillar with gear forced him into a 100′ ride to the deck. 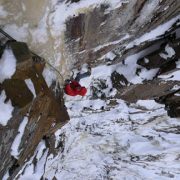 My good buddie Stanley had sent the first ascent of the Fang in WI6 conditions last Wed, 1/6/10 and I successfully made the second ascent via a different line on Saturday 1/10/10 in 15-degree weather under similar rotten WI6 conditions. The situation is completely bizarre as it did not show any fractures atop the pillar, only the usual fracture at the base-cone interface. Our weather has been typical with no real extremes in a high or low that might prompt a catastrophic failure. The ice was pretty rotten and aerated, but continuous and consistent in it’s poor quality. I’ve been playing this game a long time and have definitely pushed the limits, but this kinda threw me. It could have happened 3 days prior during my lead, Spirit energy must have been with me. Anyways, I guess for nothing more, it shows that something you think you know so well, can prove you wrong. https://www.neice.com/wp-content/uploads/2010/01/215FangOverview-1.jpg 640 479 NEice Admin https://www.neice.com/wp-content/uploads/2017/10/2012_NEice_logo_oval_blk6-1024x350-300x103.png NEice Admin2010-01-13 19:39:182010-01-13 19:39:18Ice Climber Falls 100 feet! 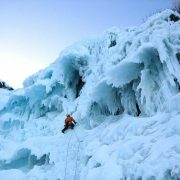 Griz- well done on your second ascent of the Fang and your buddies FA. 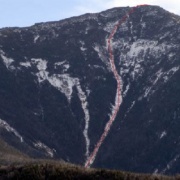 It looks similar to a route in Vail CO that was put up years ago by Alex Lowe. Bummer it fell down I hope the climber heals up strong. I was climbing with mutual friends Britton and Luchow this past weekend at Lake W., yor name came up frequently. It should be noted that climbs like these are very susceptible to failures for a variety of reasons. Perhaps a caution to everyone that such “tube” routes when heavily travalled can see allot of water infiltration due to being picked out and made more porous. 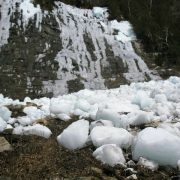 You seemed to suggest that the ice was a bit rotten, probably further exacerbating such a situation. When the interior soda straw is breached due to this type of errosion a tremendous amount of liquid water weight can suddenly be added to such a formation,now effectively a big sponge. This along with resultant hydrolics and the lubricating characteristics of a fluid can result in structural failures of varying degrees. 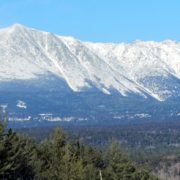 In the case of the Fang or any other such “tube” climb, it wouldn’t take much particularly when the massive cone section tends to “slump” resulting in comprimise to the base structure. Although the latter is something we tend to accomodate for when climbing these pillars, the sum total-or parts of- those things mentioned above can lead to such a catastrophy. Lets all hope and pray that one of our own is healing from his injuries.